The 1835 U.S. Custom House was designed by the famous Robert Mills. 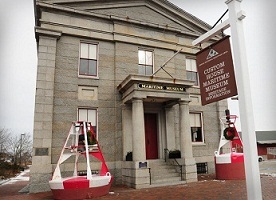 Today it serves as Newburyport's Maritime Museum. The Museum showcases many of the curiosities brought back from around the world by Newburyport's 19th century sea captains. This ends the tour. Stop inside the custom house for more on the history of Newburyport.